In the episode, titled “E My Sports”, Bart becomes addicted to an online game called “Conflict of Enemies.” The fake game seems to be a parody of popular esports games like League of Legends and DOTA 2. Simpsons producer Al Jean tweeted a preview of the episode, revealing the name of the game and how it will look in the episode. What does that actually mean? I don’t know and I’m going to guess that accurate representation of video games will most likely mean a few jokes that most folks who are still watching the show won’t get. Prepare for jokes about Bart not jungling properly! 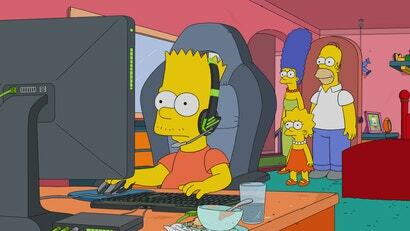 In some promotional art of the episode, we can see that Bart is playing games at a dirty desk and has a mustache. Which I really don’t understand. Bart is supposed to be 10 years old. Do many 10-year-olds grow mustaches? This facial hair isn’t surprising, the show has long treated Bart like a teenager when they need to, even if it doesn’t make a lot of sense. Maybe one day they will let you grow up Bart. One day. The episode will air on Sunday, March 17 on FOX in the United States. This kind of reminds me of that Family Guy episode a few months back that had a very topical 'Leeroy Jenkins' joke.